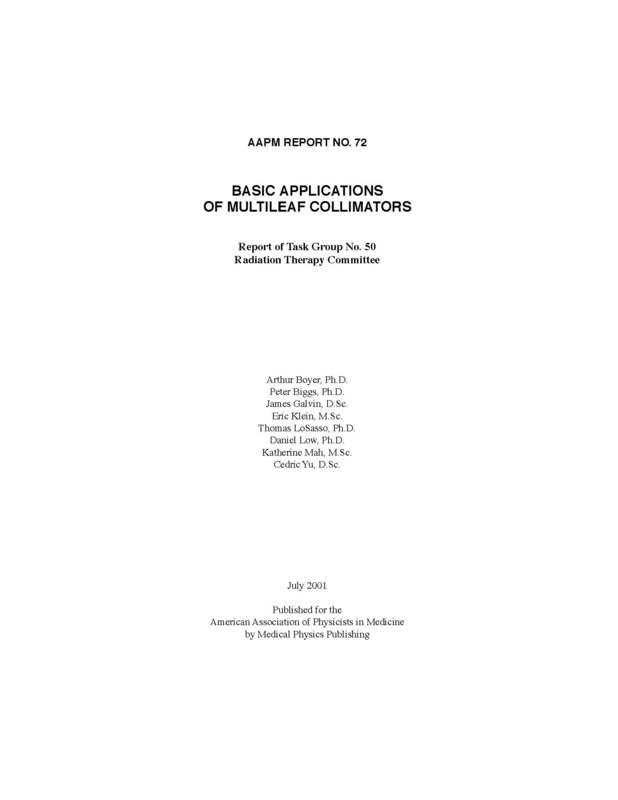 The aim of this report is to provide basic information and to state fundamental concepts needed to implement the use of a multileaf collimator (MLC) in the conventional clinical setting. MLCs are available from all the major therapy accelerator manufacturers. The use of MLCs to replace conventional field-shaping techniques is not in itself expected to improve the local control of malignancy. The rationale for using MLCs in conventional radiation oncology is to improve the efficiency of treatment delivery. Thus, the intent of this report is to assist medical physicists, dosimetrists, and radiation oncologists with the acquisition, testing, commissioning, daily use, and quality assurance (QA) of MLCs in order to realize increased efficiency of utilization of therapy facilities. It is not the intent of this report to describe research into advanced applications of MLCs in conformal therapy or dynamic treatments.